Don't let stressful situations throw your game off. Be in control of your focus and confidence. Feel cool, calm, and collected no matter what. You have the power to stay calm under pressure. Only purchased this 2 days ago, it says to try it for 21 days consistently.I will say so far so good does what it says.I am trying my best to concentrate and focus but at times my mind starts to wonder off but the beauty of the sound of the narrator's voice keep me coming back to hear his words.I like it very much and listen to it when I am doing my assignments.Would like to come back in a month and write if it made any difference.I like it already. I love listening to these. I have several of these titles and I love to put them on as background while I'm working. The only one I would change is the one that sounds kind of like whale songs because that one can be a little distracting. I would love to see more of these. I listen to thus one the most as I have a stressful job and I'm finding that while there is still some stress I don't seem to freak out as much. 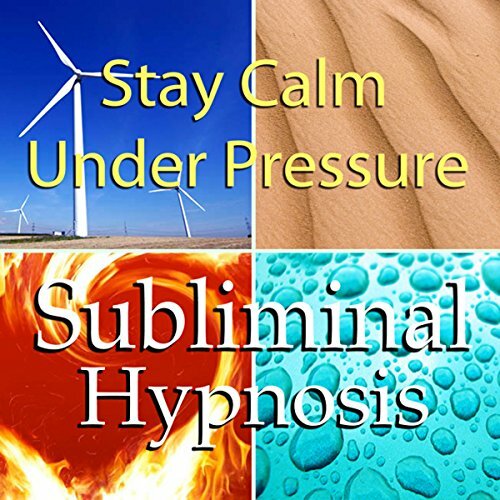 What did you like best about Stay Calm Under Pressure with Subliminal Affirmations? What did you like least? surprisingly this tape relaxed me, but i don't remember heaing any narrator's voice. i just heard sounds.